At Economy Glass we offer a wide range of shower types and styles to suit every budget. Whether you are replacing the broken shower in your rental or completely renovating your bathroom we have a shower to suit your style space and budget. As a leading provider of shower screens in Melbourne, we rely on decades of experience and advanced technology to manufacture cutting-edge products at an affordable price. Our screens utilise the best in modern design and functionality to provide full insulation and protection. We deliver custom shower screens across Melbourne’s western suburbs, including Hopper’s Crossing, Point Cook and Werribee. 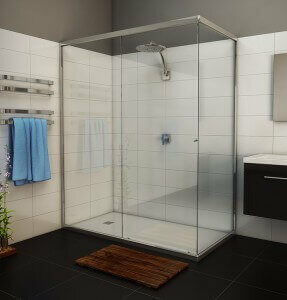 Economy Glass delivers a broad range of fully-framed showers for all home types. Securely framed on all four sides, our screens are highly flexible and can be configured to suit showers of all sizes. Popular within rental properties, or when replacing an existing screen with a similar profile. Waterproof, robust with a wide range of layouts, glass options and frame colours. The Optima Telescopic is a stock Semi Frameless shower screen that is customised to suit your space. Its flexible design allows it to fit different frame sizes, making it suitable for a variety of home specifications. It is manufactured more economically to save you more and is the cheapest option we offer. The screen can either be installed on a shower base or directly onto a tiled floor. Standard Height: Available in 1850mm and 1950mm sizes. (This shower comes in a range of stock sizes from 640 mm to 1220mm). Custom Width: Up to 1820 mm wide. (We can custom manufacture an oversize shower up to1820 mm wide). Type of Glass: 5 and 6 mm clear toughened glass available. Features: 60mm adjustment makes for easy installation. Suitable for left and right hand opening (front only). Our semi-frameless screens combine functionality with aesthetic appeal. All semi frameless screens are custom made to suit your space. Client has full control of the height, frame colour, glass colour and orientation of layout. The Custom-made Semi Frameless is an extremely versatile shower screen. It is widely used in modern bathrooms and en-suites, thanks to its sleek, modern design. It is available as either a front-only or a front-and-side shower; it can be installed on either a shower base or directly onto the floor. Type of Glass: 6 mm clear toughened glass. Colour: Silver, Gold, White &Almond Cream (as shown below). The door swings open via a frameless patented pivot mechanism that allows for a completely frameless design. The stainless steel pivot pin utilises a ‘positive close’ low friction design that minimises splashing by closing the gap between door and sill. Perfect for large openings between walls and the corner entry options are available for smaller shower enclosures in confined areas. The bottom guides can be disengaged for easy cleaning. The rollers minimise friction and provide smooth operation of the door, which is also incredibly resistant to water splashing out the door as it sits below the sill.Soft moulded stops also prevent the door from slamming open or shut. Frame finishes come in matt natural, bright silver or pearl white. Contemporary design and effortless function. Features allow for easy cleaning. As one of the leading suppliers of frameless shower screens in Melbourne, we remain committed to providing expertly crafted products for all types of homes. Our frameless shower screens are fully customised to suit your bathroom’s specifications. They are a sleek, space-saving solution that can loosen up the divisions between the different parts of your bathroom, improving the flow of movement and enhancing its overall look. Our frameless shower screens come with a wide range of customisation options. We work closely with our clients during the design phase, to provide advice and listen to your requests to ensure we are able to make your shower exactly the way you would like. Fully customisable in all aspects these shower screens are the perfect addition to any new bathroom and are sure to make an impression. Our frameless showers come with a wide range of hinges that complement specific size and design requirements including heavy-duty hinges for the largest frameless shower doors. Square and bevelled-edge finish hinges are available. Included along with our hinges are an array of finishes, including polished chrome, satin chrome, electroplated black finishes and numerous others available upon request. Providing you with completely custom shower solution whether it’s a pivot hinged door, sliding shower or a minimalist single fixed panel for the ultimate clean look and finish. For technical details and applications of our range of hinges simply get in contact with us. We also supply additional hardware along with our frameless door, including brackets, handles and bracing bars; available in a wide selection of finishes and styles. Whether it’s a hinged door, a sliding door or a minimalist single fixed panel, we provide skilfully produced custom solutions to fulfil your needs. We design our frameless sliding showers with space efficiency and flexibility in mind. Their simple, elegant design adds an open and luxurious character to your shower and is an affordable way to upgrade your home’s aesthetics. The V2 Opto is a highly flexible frameless sliding shower that comes in three different configurations for space optimisation purposes. The V2 is easy to operate and can fit into a variety of bathroom sizes seamlessly. Type of Glass: 8mm or 10mm toughened glass. Bracket Material: Manufactured in architectural grade 304 stainless steel. Maximum standard door/sidelight dimensions: 1650mm. (Custom sizes up to 2400mm available). Available finishes include polished stainless steel, satin stainless steel and electroplated black. Copyright © 2018 Economy Glass. All Rights Reserved.